Laser shots strike a diamond anvil, driving a mixture of helium and hydrogen to the crushing pressures seen in Saturn’s interior. Using one of the world’s most powerful lasers, physicists have found experimental evidence for Saturn’s helium “rain,” a phenomenon in which a mixture of liquid hydrogen and helium separates like oil and water, sending droplets of helium deep in the planet’s atmosphere. The results show the range of blistering temperatures and crushing pressures at which this takes place. But they also suggest that a helium rain could also fall on Jupiter, where such behavior was almost completely unexpected. “We’re showing the first experimental evidence at conditions relevant to Jupiter and Saturn,” says Gilbert Collins, an extreme matter physicist at Lawrence Livermore National Laboratory (LLNL) in Livermore, California. “It’s a surprise that [this] happens over such a broad regime of temperatures and densities.” Collins described the results in a talk yesterday at a meeting of the American Geophysical Union in San Francisco, California. Saturn is more than 50% brighter than it ought to be for a normally cooling planet. One way to account for this is through the behavior of its massive envelope of hydrogen and helium gases. As temperatures and pressures rise in the planet’s interior, the gases become liquids. At still deeper levels, the liquid hydrogen becomes electrically conductive, or metallic, while the liquid helium remains mixed in. But once conditions surpass a certain threshold of pressures and temperatures, the liquid helium is expected to fall out of the dissolved mixture. According to theory, this liquid helium forms droplets of “rain” that fall further towards Saturn’s core, unleashing gravitational potential energy that makes Saturn more luminous. Theorists imagined this could never happen on Jupiter, which is hotter than Saturn. This extra heat is thought to stir up the helium-hydrogen mixtures more vigorously, preventing the helium from falling out as rain. Theories have suggested helium rain on Saturn since the mid-1970s, but experimental evidence has been lacking. The evidence is now in. 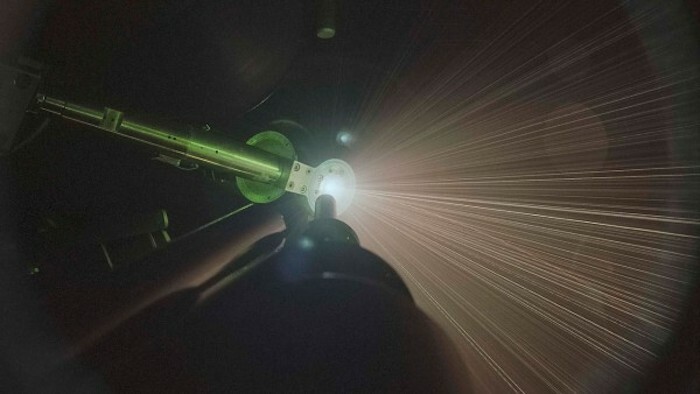 Collins and his colleagues used the OMEGA laser at the Laboratory for Laser Energetics at the University of Rochester in New York, which can produce 40 kilojoule pulses of intense light for a nanosecond. They first put a hydrogen and helium mixture between two diamond crystals, compressing the mixture until it became a liquid. Then they shot the laser through one end of the diamond anvil cell—vaporizing the diamond instantly and sending in shock waves that further compressed the mixture. At certain temperature and pressure thresholds, the scientists noticed a sharp rise in the conductivity of the mixture—a sign that the helium had separated out of the soup and left only the highly conductive metallic hydrogen. But OMEGA’s results may not be the final word. Its measurements often conflict with those of Sandia National Laboratory’s Z machine, which can perform similar high-pressure experiments. “It’s a reflection of how hard it is to do experiments in this range,” says Stewart, who adds she will be looking to the Z machine for confirmation of the new results. Stewart says the study should help NASA’s Juno mission come up with better models of Jupiter’s interior layers when the spacecraft goes into orbit around the planet in July 2016.